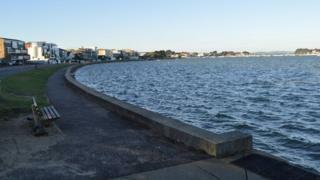 Excessive quantities of green seaweed are causing a sewage-like stench in Poole Harbour, the council has said. It follows complaints from residents about the smell, particularly in the Whitley Lake and Shore Road area. However, Wessex Water said there had been no sewage discharges or pollution events in the area. Borough of Poole council said it was working to determine the "best means of dealing with this unusual build-up of seaweed". It added it was working with Poole Harbour Commissioners, Natural England and other agencies. It is also carrying out additional water sampling and will continue to monitor the area. Water sports enthusiasts are being advised to avoid contact with the algae. They have also been advised to follow Public Health England's general guidance for reducing the risk of illness when open water swimming, including minimising the swallowing of water, showering soon after and washing hands before eating.